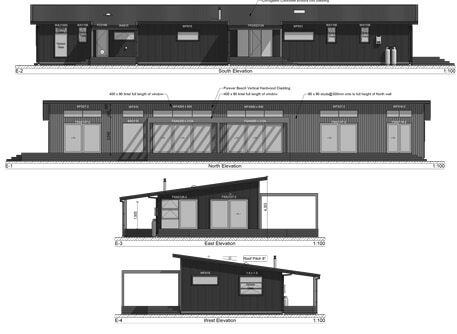 Our client presented us with a detailed concept for this timber cladded home in North Canterbury. Alongside our architect we turned the concept in to a working design which maximised our client’s living objectives within budget. Being a handyman, our client was set from the outset on completing many of the related projects himself, such as the impressive sized decking which will eventually surround the entire home. Based largely on our client’s own specifications, we developed the design borrowing ideas and proven approaches from some of our standard plans, like the Nikau. 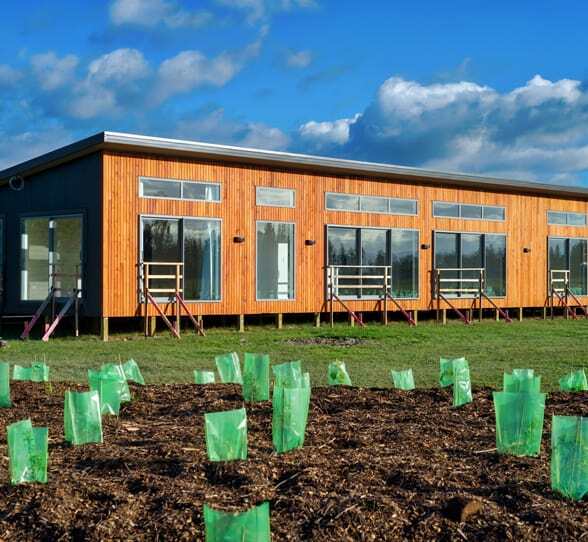 The home features high windows to really soak up the North Canterbury sun, ensuring cost effective passive warmth in the winter, and beautiful a sun soaked home in the summer. Pitched ceilings throughout most parts of the home provide a spacious feeling. Large bedrooms are complimented by a large master ensuite with walk-in wardrobe and windows to take in the surroundings, as well as a second ensuite and WC. In all, there is considerably more squeezed in to this 190 square metre space than one would expect, on the back of some very well considered design and planning. A relatively high spec home, we worked hard to meet the 6 month build target. A well oiled team emerged managing the build process in the form of Phil, Rob and Scott (Client, Builder and Project Manager respectively), with their combined efficiency and decisiveness ultimately meaning a smooth project all round. When building a home there are an estimated 300,000 things which could cause delays or disruptions to the build. And for this reason we like to ensure our clients are fully informed and prepared for the building process. Because Phil our client had built previously, he was well aware of the potential for things to go astray without proper planning and management. So he was always well organised and across the specifications which really contributed to a smooth build. Our clients had a really good idea of what they wanted in the way of interior selections. A few conversations were had with our Colour Consultant, as well as Scott the Project Manager about what would work well from a colour and technical perspective, but the ultimate choices were made by the client. Neutral colours, timber matchlining blended with crisp apple colour flooring, dark red colour wardrobe joinery and tiles for contrast were the choices made and perhaps you agree – they work really well. This is a custom designed, 3 bedroom home using materials ideally suited to the rugged conditions inherent in the Canterbury High Canterbury. If you like it, then browse the Solid Timber range of homes. They’re very popular and easy to assemble as kitsets, or we can build it for you. Each design can be built straight from the plan, can be customised to your needs or even 100% architecturally designed from scratch, like this one.